New Felting Obsessions creeps into my Studio!! It’s so much fun to learn something new and expand the boundaries of what one can do as an artist with a particular medium. For me, my medium is fiber- and I’m constantly amazed by what it can do. I love wet felting- as much as I’ve done. I felt soaps and make beautiful beads. 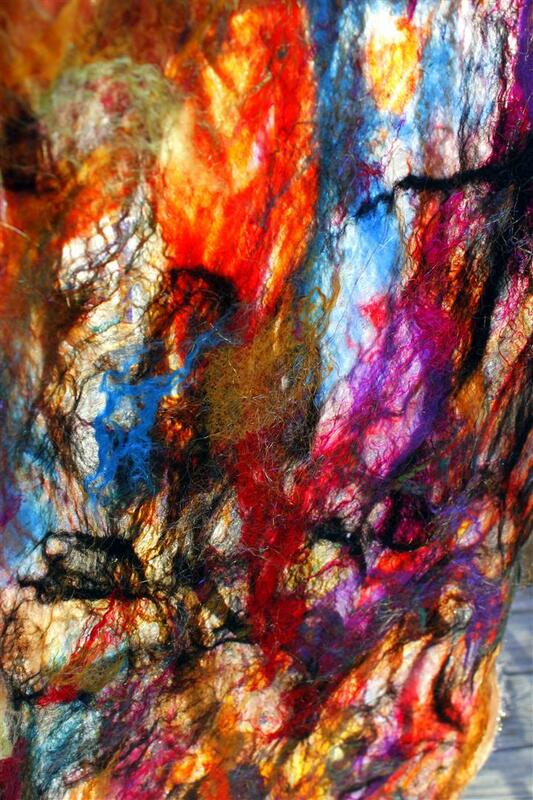 I love nuno felting, which is felting onto fabric. It was a logical progression to move from nuno to cobweb felting, Cobweb felting created a very light, lacy fabric without the addition of actual fabric, like you use with nuno felting. I was pointed towards a wonderful tutorial that uses the dryer for the hardening, rather than “rolling” ! This not only cuts down on the physical effort it takes to create these feltings, but it cuts down on the time it takes to create them as well! While one is thumping around in the dryer, I can be working on the next piece! My first piece was done with a traditional cobweb felting method, using some hand dyed merino top. Merino is wonderful for felting because of the shorter staple, elasticity and softness. It felts quite quickly, so 3 rounds in the dryer gave me a soft, lacy scarf. I added bits of sequins novelty yarn and angelina before I wet it, and everything “stuck” with no problems. I even fulled the scarf in the dryer, dunking it into hot water and then allowing it to “thump” around on no heat. Every couple minutes I would pull it out, stretch it back to it’s original size (this gives the fabric strength), dunk it back into hot water and put it back into the dryer for another couple minutes. I keep going until I feel the fabric is strong and I like the texture it has. Then a quick iron if I want it pressed and voila! Next I wanted to see if my batts would work as well as the top. I created a technique similar to that of the traditional cobweb- except the way the fiber is laid out is a bit different since the fiber prep is different. What I was really looking to see is how heavy the fabric would become and how the texture would enter into play. 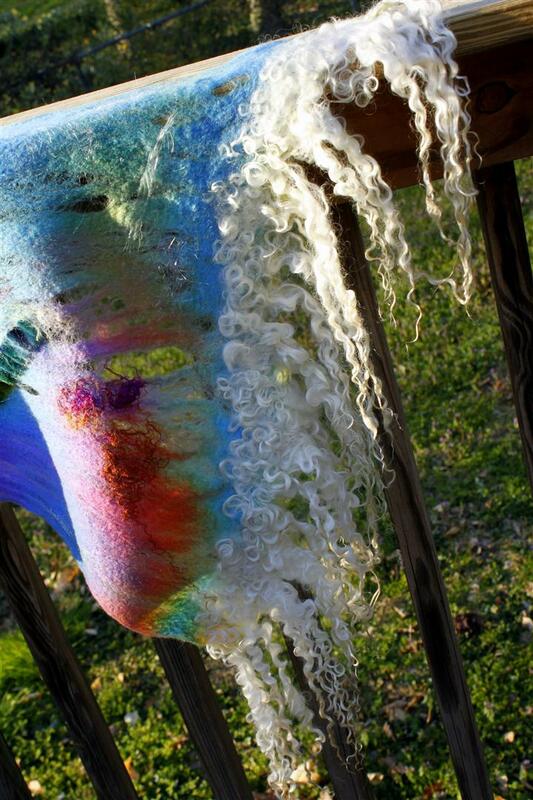 I used a bright batt I carded with merino, farm wools, locks, silks and sari silk waste and ribbon. Once again I was able to create a soft, lofty shawl that feels weightless.. except this time within the cobweb was texture. Amazing texture! 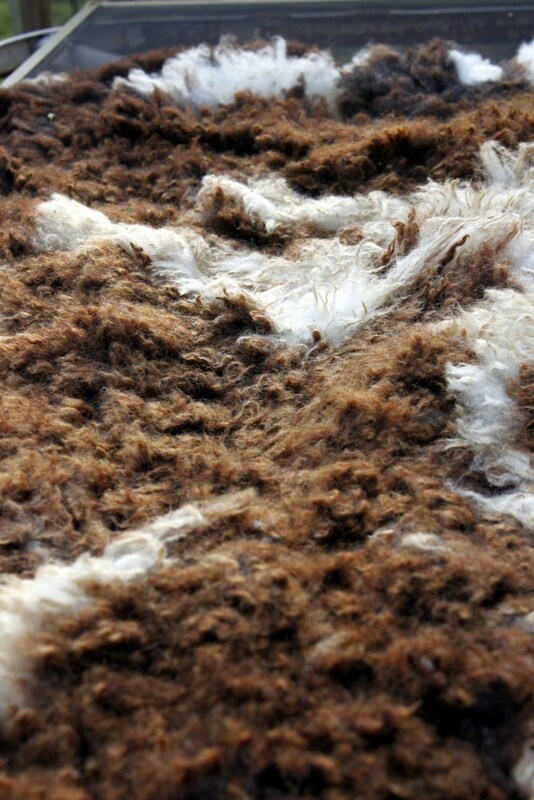 Wool acts as “glue” so it really seals in all that amazing “stuff” that traditional cobweb felting might not allow. The most wonderful thing about felting with batts, is that the fabric becomes reversible! Equally amazing on both sides!! Next I combined the 2 techniques.. traditional cobweb, with the more textured technique I’d come up with. I used beautiful hand dyed merino/soysilk top dyed a couple years ago by Mandie from Ewe Give me the Knits. She blends her top on her own “Beast” so she makes the yummiest, and most unique blends! 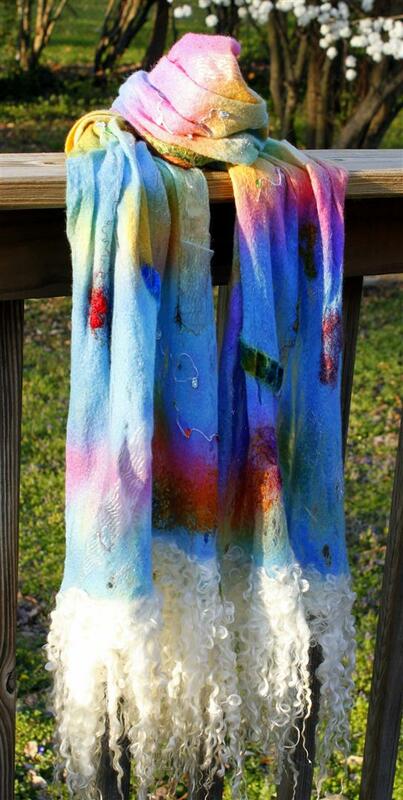 I added textural “bits” with silk velvet, sequins yarn, iridescent fabric and sari silk threads. I then added some of my signature extra long teeswater locks for fringe. This created the amazing smooth traditional cobweb look with that funky texture that I love.. and OH so amazing fringe! I think I will now be dyeing tops and locks in the same pot so I have matching fringe to use for the next batch of feltings!! So not only have I become obsessed with the shawls and scarves.. but I’ve moved into accessories as well!! My amazing friend, artist and teacher, Victoria Cleg, came over and taught me how to wet felt a purse!! OMG I’m totally in love!! I carded up a batt of alpaca, merino. shetland, cormo, mulberry silk and lots of angelina. I used Suzanne Morgan’s technique of bringing a sander into the felting process, rather than just rolling. This fulled the fabric much faster and with much less work. Important to be SMART when using power tools with felting (ie water!!) Wear rubber shoes and make sure what you are working on is well covered with plastic and DRY before you apply the sander. After I shrunk the base of the bag I needle felted beautiful multi colored cotswold/bfl locks onto the bottom. I used locks from the same fleece to spin the handle (tailspin, coil then chain ply) so it all complements. Then I secured the handle with hand made tree branch buttons from Asheville. I LOVE the final result! Finally, I’ve started felting “sheepfriendly” pelts using the technique in Lexi’s new book, Handspun; New Spins on Traditional Techniques. I used for this “pelt” a beautfiul Jacob fleece I got at Alpaca Yarn in Alpharetta. It was sheared so beautifully that it unrolled in a blanket. The locks were perfect and the colors were just fantastic! Renee and I spent the afternoon enjoying the early Spring sunshine and felted it into this beautiful SheepFriendly pelt! 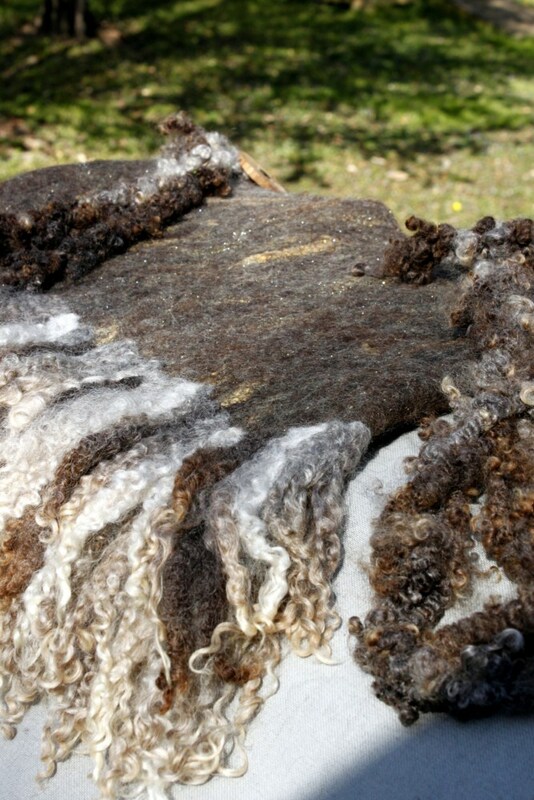 I have 4 more Jacob fleeces to felt like this, and I’ll be on the search for more to felt at Maryland Sheep and Wool!! Happy Spring and I’ll have some new nuno and cobweb shawls with my Ethereal Cloud batts next week! ← Spring Shop Updates- Lots coming!